Before and After mold inspection samples and tests. Consultation and advice on preventative actions to reduce the risk of any future mold growth. A mold inspection basically involves two actions; finding where the mold is growing in your home and investigating to find what caused the mold to grow in the first place. Even if you are already aware of mold growing in or around your house or building, it is always a good idea to perform a thorough mold inspection as visible mold growth is usually a positive indicator that there is more mold growing somewhere out of view. Our mold inspection experts use a wide range of high tech mold detection equipment to investigate, collect, and analyze all of our findings, such as: Swab Samples, Air and Moisture Readings and Test Samples, Physical Mold Tests, non invasive Inner-Wall infrared scanners, Manual Readers, Laser Scanners for Foundation Beams, Leak and Moisture Detection scanners, Air meters, and Toxic Mold Sensors. The first type of common mold found in the house is the Aspergillus Penicillium. This mold causes allergies to the people exposed to it, some are more susceptible than others. 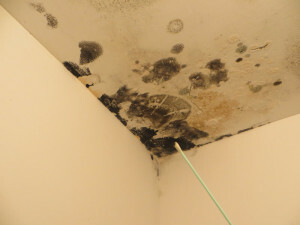 You can find this mold growing in places such as on food, decaying materials, soil and dust, and in the air conditioner. Cladosporium is the next most common type of mold found growing inside. 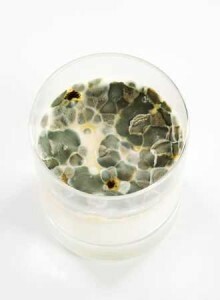 You can find this mold growing in dark green or in black color. It is powdery in texture and grows on fibers, glass, air ducts, dead plants, food and paint. This mold can cause pulmonary diseases, skin rashes, asthma and nail fungus. You can find the next type of mold Memnoniella growing on cotton, wooden products, and paper. This mold releases toxins which are very harmful to the people and pets living in the house. Stachybotrys is commonly known as the black mold. It is black, slimy and toxic in nature. It produces very harmful toxins that cause deadly diseases like asthma and cancer. It generally grows under the walls and ceilings. Mucor is another common type of mold found growing in the homes and buildings. It is normally found growing on or nearby animal droppings and surrounding soil. This type of mold causes lung infections to the people who are weak and sensitive. Alternaria, another form of mold, releases allergens which lead to allergic reactions like asthma, wheezing, hay fever, cough and other reactions. Mostly it grows on plants and soil. This is one of the reasons that it is so dangerous as by the time it is finally noticed, lets say growing on the outside of an interior wall, there is usually a massive mold growth in the underlying affected area. This type of mold infestation would require a professional NYC mold removal company. The NYC mold experts will quarantine and seal off the entire affected area from the rest of the building, and employ high pressure ventilation systems. The mold removal experts have to wear body suits, helmets, and breathing apparatus to protect them while cleaning, neutralizing, and removing all mold damaged materials. Please note: The residents of the home usually leave the home during the eradication. The mold testing process utilizes the mold samples and data collected during the initial mold inspection. Mold testing helps to confirm whether you in fact have mold growing inside your home or building, the type(s) of mold found in and around your building, the levels of mold spores present, etc. Professional lab scientists who have experience in analyzing mold samples can lead to a more effective mold remediation process. It is always a good idea to hire a highly qualified mold inspection professional that works with independent laboratories. This helps to remove any conflict of interest with the confirmation of the data and samples collected by the NYC mold inspectors. 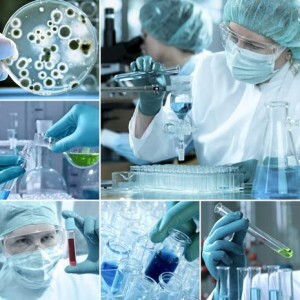 Our mold tests are conducted in an independent laboratory, both before and after the completion of the job to insure the elimination of all airborne mold spores. Some people say if the mold growth is only covering a small area, usually 3-10 square feet or so, and is not toxic(if you can determine this, then you should be able to perform the mold redemption yourself. Well, this is not always a safe idea and for several reasons. The affected areas need to be completely sealed off as to prevent the spread of the possibly toxic mold spores from traveling and settling in other parts of the house as well as to prevent mold spores from stirring into the air and contaminating any other part of the structure. Once you have contained the mold, use a solution to remove the mold from the surface. Solutions available in the market for mold removal include Borax, Vinegar, Ammonia, Tea tree oil, fungicides, biocides, etc. Proper ventilation needs to be used along with personal safety equipment and respirators. All mold damaged materials need to be treated and removed in sealed bags. HVAC systems will also need to be disinfected and treated. – Final mold inspection, sample collection, and mold testing. When it come to mold removal, it is always advisable to hire an established, licensed, insured, and certified mold removal and remediation service provider; regardless of how small of an infestation. 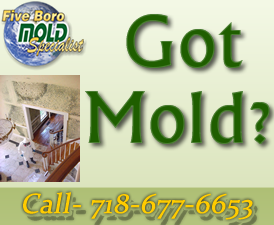 Five Boro Mold Specialist Inc., a New York City mold inspection, mold testing, and mold removal company in NYC, has been providing the NYC metropolitan area for roughly 25 years. 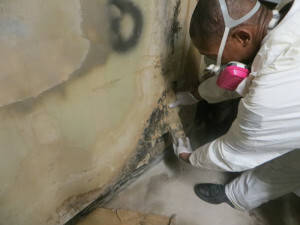 Specializing in non invasive high tech mold inspections, “conflict free” mold testing, and rapid mold removal services in New York City.